This Wallace family is Scottish in origin. We have not yet been able to connect our family to their origin in the Old World. Our earliest proven members of this line were living in Amelia Co., Virginia in the early 1700s, but they are likely connected to earlier generations of Wallaces that had been in Virginia since the 17th Century. Various spellings of this name have been used over the years. The name was often spelled "Wallis" or "Wallice" by earlier generations, although it seems that the spelling "Wallace" was the proper spelling. By default, I have listed everyone below with the spelling Wallace, even though they were often spelled differently in contemporary records. John Wallace was born circa 1690s, probably in Virginia. He died after January 2, 1754 and before July 1, 1757 in Amelia Co., Virginia. John had married his wife Mary probably during the 1720s or early 1730s. In 1736, they were living in Amelia Co., Virginia, although they had probably been there for many years. John raised a large family of children, who were all named in his will, dated January 2, 1754. The birth order and birth dates of his daughters are not known, the list shown below is the order that they appeared in his will (other than daughter Rhody who I have listed first because she was the only one then married). John married Mary probably in the 1720s or early 1730s in Virginia. She was born at an unknown date and died before March 23, 1780 in Amelia Co., Virginia. Mary wrote her will on July 15, 1773 which was proven on March 23, 1780. 2 John Wallace was born circa 1734. 3 Matthew Wallace was born circa 1736 in Amelia Co., Virginia. He died before May 19, 1759 in Amelia Co., Virginia. Matthew's wife Sarah was remarried to Robert Davis sometime between 1759 and 1768. 4 Rhody Wallace died after 1754. She married unknown Dickson before 1754. 5 Joan Wallace died after 1754. 6 Jane Wallace died after 1773. She married James Rice in 1759. 7 Mary "Molly" Wallace died after 1773. 8 Sarah "Sally" Wallace died after 1773. 9 Susanna Wallace died after 1754. 10 Dillary Wallace died after 1754. Jeff Wallace was born circa 1732, probably in Virginia. He died before June 1763 in Amelia Co., Virginia. Jeff was probably the oldest son in his family. His name was probably Jeffrey/Geoffrey, but he was usually listed with the name "Jeff" in contemporary records. According to the Amelia County tithables list, Jeff apparently first moved out of his parents' household and into his own in 1753 or 1754. Jeff died sometime prior to June 1763, when the court ordered an estate inventory and appraisement. These were performed on August 19, 1763 and then returned and recorded on September 22, 1763. Note: There is no known direct proof that Jeff was the father of the below three children. There is various circumstantial evidence though which suggests that John was the son of Jeff. There is also proof that John was the brother of David and Agatha. Jeff married Sarah probably in about 1754. She was born at an unknown date and died after 1783. Sarah's maiden name is unknown. Sometime after the death of her first husband, she remarried someone with the last name Turner. In 1783 in Amelia Co., Virginia, she transferred land with her son and daughter-in-law. 2 David Wallace died after 1786. He apparently moved to North Carolina with his brother. Many online family trees list David Wallace (c. 1759-c. 1819) of Dickson Co., Tennessee as the son of John Wallace and Sarah Granger [Crenshaw]. He was much too old to have been there son, but it is possible he was John's brother. 3 Agatha Wallace died after 1782. In 1790, they were most likely the Joseph Stephens household enumerated in Wake Co., North Carolina, near Matthew Wallis (Agnes' cousin). No further information. In 1820, John Wallace (below) acknowledged having a grey mare that was sent to him by his "cousin" John Stevens of Wake County, North Carolina. It was likely that John Stevens was related in some way (son?) to Agatha and Joseph Stephens/Stevens. John Wallace was born circa 1755 2 in Amelia Co., Virginia. He died on November 17, 1845 2 in Iredell Co., North Carolina. He was possibly buried in the New Sterling Associate Reformed Church Cemetery, Iredell Co., North Carolina (where no tombstone survives). John was born and raised in Amelia Co., Virginia. He enlisted in the military in 1775 in Amelia Co., Virginia. He served as a dragoon in the Revolutionary War from February 1776 to December 1778. During his service, he was at the battles of Germantown, Brandywine and Monmouth. After his discharge, he returned to his hometown and was married to Sarah Crenshaw in 1780. According to an affidavit in his Revolutionary War pension file, his marriage in 1780 was apparently something of a scandal. The 1846 declaration of Samuel Blankenship (who was probably John's cousin) includes the following sentence: "his Father being displeased with the marriage made it the subject of much talk in the neighbourhood". (At the time of the marriage, John's father Jeff was long dead. One possibility is that this may have been a reference to a stepfather (unknown Mr. Turner?). Or, it may have been a reference to Samuel Blankenship's father, who was related to the family in some way. Another researcher has proposed though that the word "his" actually reads "her", indicating that it was Sarah's father (William Crenshaw) that was displeased). It is not known why though the marriage was apparently not approved of. Also in Samuel Blankenship's declaration: "after their marriage they lived about two years in the house with my grand mother". It is not known who this grandmother was. The first assumption was that it might have been Mary Wallace (who was probably grandmother to both Samuel and John), yet she had died before the marriage. Either way, John and Sarah lived somewhere in Amelia County within the first two years of marriage. In about 1782, they moved to Wake County, North Carolina. They lived there for a number of years until sometime during the 1790s when they moved to Iredell County, North Carolina, where they remained. In 1819, John applied for a pension for his Revolutionary War service, which was awarded at $8.00 per month. 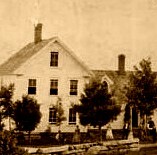 In about 1835, John's family home burned down. The record of their marriage and births of their children (probably a bible) was burned in the fire. Note: various online resources have listed John with the middle name "Allen". There is no known contemporary source which provides any middle name or initial for John. The source of the supposed middle name is unknown, and may have just been a simple error that got promulgated through the internet. However there was an "Allen Wallis"
John married Sarah Crenshaw on May 25, 1780 in Amelia Co., Virginia 2. She was born circa 1762 2 in Virginia. She died on November 14, 1846 in Iredell Co., North Carolina. She was possibly buried in the New Sterling Associate Reformed Church Cemetery, Iredell Co., North Carolina (where no tombstone survives). Sarah is usually listed with the last name Granger. In actuality, Granger and Crenshaw were variations of the same name. Sarah was named in her father's will of 1786 as Sarah Wallis. Since Matthew Wallis was listed as a witness to the will, many researchers have concluded that she was the wife of Matthew (John's cousin). In actuality, various circumstantial evidence points to her being married to John Wallis/Wallace. 1 Martha Wallace was born circa 1781 1 in Amelia Co., Virginia. She died in May 1870 in Ollin Twp., Iredell Co., North Carolina 3. She is buried in the Snow Creek Methodist Church Cemetery, Iredell Co., North Carolina. She married John Graham on January 14, 1804 in Iredell Co., North Carolina 5. He was born on or about August 5, 1773 6 and died on June 30, 1839 6 in Iredell Co., North Carolina. He is buried in the Snow Creek Methodist Church Cemetery, Iredell Co., North Carolina. Martha and her husband settled in Iredell County after their marriage, where they spent the remainder of their lives. Martha was probably the oldest child in her family. In her 1846 declaration, Sarah Wallis stated that her oldest child (who she did not name) was born in the year 1781. Some online family trees provide the birth date of October 11, 1781 4, yet I have been unable to determine the source of that date. Contemporary sources suggest that while many of Martha's siblings were somewhat poor, Martha and her husband were relatively wealthy (owning slaves and land). 2 Jane Wallace was born circa 1784. Although we do not know the identity of Jane's husband, he may have been related to Samuel Blankenship (1764-1847) of Iredell Co., North Carolina who submitted a declaration in 1846 in support of Sarah Wallis' pension application. 3 Sarah "Sally" Wallace was born circa 1788 in North Carolina 1. She died after 1860, probably in Morgan Co., Tennessee. She married George Gilbreath on August 7, 1807 in Wilkes Co., North Carolina. 4 Warren* Wallace was born circa 1790 in Wake Co., North Carolina 1. He died sometime between 1850 and 1860 in Wilkes Co., North Carolina. Warren settled with his family in Iredell County, North Carolina after his marriage, where most of his children were probably born. Sometime between 1840 and 1850 they moved to nearby Wilkes County, North Carolina, where they remained. In 1850, his occupation was listed as blacksmith. * His name is spelled variously in contemporary records as Warren, Wren, Warning, Worring and Wanning. 5 Agnes "Agatha" Wallace was born circa 1790 1 in North Carolina. She died after 1821. In 1820, John Wallis indicated that his 30-year old daughter "Agness" lived in his household and that she was "not very healthy but usually able to perform ordinary business". She was apparently married and out of the household by the 1830 census enumeration. 6 Susan (or Susanna) Wallace was born circa 1792 in North Carolina 1. She died on January 22, 1877 in Iredell Co., North Carolina. She married Darling Allen on April 1, 1809 in Wilkes Co., North Carolina. (He was born circa 1787 in Wake Co., North Carolina and died on May 20, 1867 in Iredell Co., North Carolina. 7 Lucinda Wallace was born circa 1794 in North Carolina. It is possible that Lucinda's husband may have been related to H. M. Smith who submitted a declaration in 1846 in support of Sarah Wallis' pension application. 9 Harriet Wallace was born circa 1798 2 in North Carolina. She died after 1821. In an 1820 declaration, John Wallace stated that his 22-year old daughter Harriet had been crippled for 17 years (or since about the age of 5) in her feet, legs, hands and arms and was not capable of walking or even standing. She was described in a letter her mother wrote on December 22, 1821. She had probably died before 1830 when she was not enumerated with her parents in the census of that year. In her 1846 declaration, Sarah stated that she had 11 children, yet the names of only 9 are known. The other children apparently died before 1846. One possibility is that they had a son named John. Apparently a John Wallis reported the death of John Wallis in 1845, but was not listed as a surviving child of Sarah Wallis in 1847. This has led some to speculate that there was a son named John who died between 1845 and 1847. This theory appears to be corroborated by early census records (if son Warren was not yet born at the time of the 1790 census enumeration, then there may have been an additional son). If they did have a surviving son named John, he was probably born in the early 1780s and living in his own household in 1820. Elizabeth Wallace was born circa 1796 in North Carolina 1. She died after 1850, probably in Iredell County, North Carolina. Elizabeth was one of the youngest children in her family. She was either born in Wake County (where her parents lived in 1790) or in Iredell County (where her parents lived in 1800). She spent her youth and most (or all) of her adulthood in Iredell County, North Carolina. She was probably briefly married to someone with the last name Snead/Sneed during the 1810s. If that is the case, she was widowed (or divorced) before 1820. She had at least one surviving daughter (possibly two) from her first marriage. Her unidentified first husband may have been a relative of Sarah Sneed who married Matthew Wallis/Wallace, her father's cousin. Both Sneads/Sneads were also probably related in some way to the family of Robert Sharpe Snead (c. 1760-1846) of Amelia Co., Virginia and later North Carolina. (Robert's son Robert Jr. was married to Lucy Wallace). Various online family trees have listed Cordia's father (and thus Elizabeth's husband) as John, Robert or Charles Snead/Sneed. Elizabeth was married to Andrew Current sometime before 1820. They lived together near her parents in Iredell County. In 1821, Elizabeth's disabled sister Harriet briefly stayed with them at their home. Her husband Andrew died sometime between 1840 and 1850. In 1850, Elizabeth was the head of the household with her children in Iredell County. There are no known records of Elizabeth after this date, which suggests that she died sometime before 1860. Elizabeth married first Unknown Snead circa 1815 in Iredell Co., North Carolina. He probably died before 1820. 1 Cordia* Snead was born circa 1818 ** 1 in Iredell Co., North Carolina. She died on December 12, 1856 7 in Iredell Co., North Carolina. She is buried in the New Bethany Baptist Church Cemetery, Iredell Co., North Carolina. She married Robert Alexander Stewart sometime between 1830-1840 in Iredell Co., North Carolina. * Her name is listed as Cordia or Cordie on nearly all surviving records. Strangely though, the 1850 census lists her name as "Jane D". It is probably because of this that some descendants have suggested that her name was originally "Jane Decordia". Others have provided her name as "Mary Jane Decordia" or "Mary Jane Cordia", which is apparently confusing her with her husband's second wife, Mary Jane Warren. It is possible her original name was "Cordelia" (her half-niece Cordelia Current often went by "Cordie" or "Cordia"). However, it's possible that Decordia was the original name, because her same niece was listed as "Decordia" on her death certificate. ** Cordia's tombstone provides her birthdate as August 12, 1812, yet this is probably an error. The 1850 census suggests that she was born in 1817 or 1818 and the 1830 census suggests she was born between 1815 and 1820. Her tombstone was erected many years after her death and is thus not a reliable or contemporary source for her birthdate. Note: there is no proof that Cordia Snead wife of Robert Stewart was the daughter of Mr. Snead and Elizabeth Wallace (who later married Andrew Current), but the connection is likely. Stewart family history indicates that Cordia's last name was Snead or Sneed and that she came from Onslow County, North Carolina. However, the death certificates of one of her daughters (Martha) clearly lists her name as "Cordie Current". To add to this, Stewart family history indicates that Cordia's mother was Elizabeth Wallace, a daughter of John Wallace. Since the Elizabeth Wallace who married Andrew Current was the daughter of John Wallace, this connection is too much to ignore. In the 1840 census, Robert Stewart (husband of Cordia) was enumerated on the same page as Andrew Current and John Wallace (father-in-law of Andrew). Plus, the fact that Hugh Current (son of Andrew and Elizabeth) named his daughter Cordelia "Cordia" Current, probably also suggests a family relationship. Additionally, Cordia named one of her daughters Dorinda Stewart; and one of Elizabeth Wallace Current's sisters had a daughter named Dorinda Graham. Finally, in 1880, Cordia's unmarried daughter Angeline Stewart was living in the household of Mahala Massey, who was the daughter of another one of Elizabeth Wallace Current's sisters. It would make sense that Cordia's real name was Cordia Snead, but that she sometimes went by the name Cordia Current because that was her stepfather's name. Cordia was probably one of the females in her age group enumerated in the household of her stepfather Andrew Current in 1820 and 1830. There is no evidence to suggest that Cordia Snead Stewart ever lived in Onslow County, North Carolina; although it is possible her unidentified father was from there. She married second to Andrew Current before 1820 in Iredell Co., North Carolina. For information on her children, see his page. 1. Assorted Federal US census records. 2. Revolutionary War Pension Application File of John and Sarah Wallis, 1846. 3. 1870 Mortality Schedule, Iredell Co., NC. 5. Graham, Robert L. Grahams of Rowan and Iredell Counties, North Carolina. AuthorHouse, Bloomington, IN, 2012. 6. Tombstone inscriptions, Snow Creek Methodist Church Cemetery, Iredell Co., NC. 7. Tombstone inscriptions, New Bethany Baptist Church Cemetery, Iredell Co., NC.